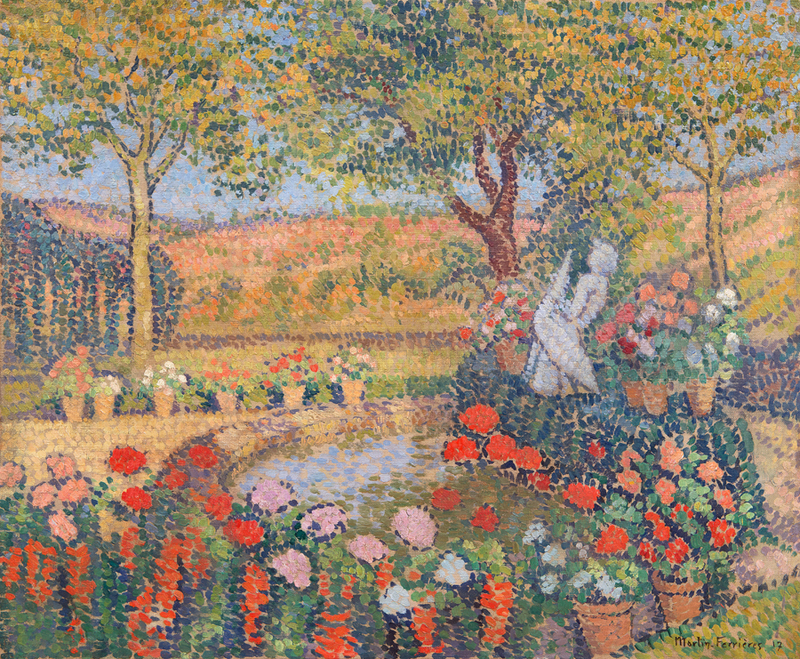 Born into a family in which the arts were held in the highest honor, Martin-Ferrieres did not draw attention to the fact that he was the son of Henri Martin in order that his success might be solely due to his own merits. He had the most profound veneration for the talent and work of his father and fully acknowledged the debt he owed for the lessons he received from him, but he felt that notoriety had only a pecuniary value, of which he had a horror, for only too often notoriety had no relation to real talent. with unfavorable criticism as “the son of …” which is quite understandable because many sons carry on the same profession as their fathers, influenced by ease and the established reputation of the father. In addition, Martin-Ferrieres feared he might be mistaken about his true vocation, mistrusting that precocious skill which brings rapid but ephemeral recognition. He need not have worried, since his artistic career was fruitful and marked by success. The education Martin-Ferrieres received was very thorough. From the age of six onwards, he drew and was always attracted to painting, but he studied both literature and the sciences and received his degree in science. These advanced scientific studies proved to be of value when he turned entirely to painting, for he had a strong knowledge of chemistry as applied to painting techniques. He was a fervent musician and played the piano, organ and cello. For him music was food, and the ideal respite after long hours of work at his easel. It was in 1923 that Marin-Ferrieres received his first major honor. In the 1920 Paris Salon he had received an Honorable Mention, and in 1923 in the same Salon after his painting “Le Christ” was awarded the Silver Medal, it was purchased by the French State. 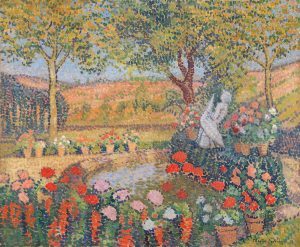 In 1924 another canvas, “Le Boeuf”, won him a traveling grant which enabled him to discover Italy and its artistic wealth. When he returned to France after that trip, he had his first one-man exhibition. In 1925 he was awarded the Prix National for his important composition “Le Peintre”, which was later exhibited at the Carnegie Institute in Pittsburgh. In the three-year period 1925-1928, Martin-Ferrieres made several visits to Italy to make a close study of the Italian masters. 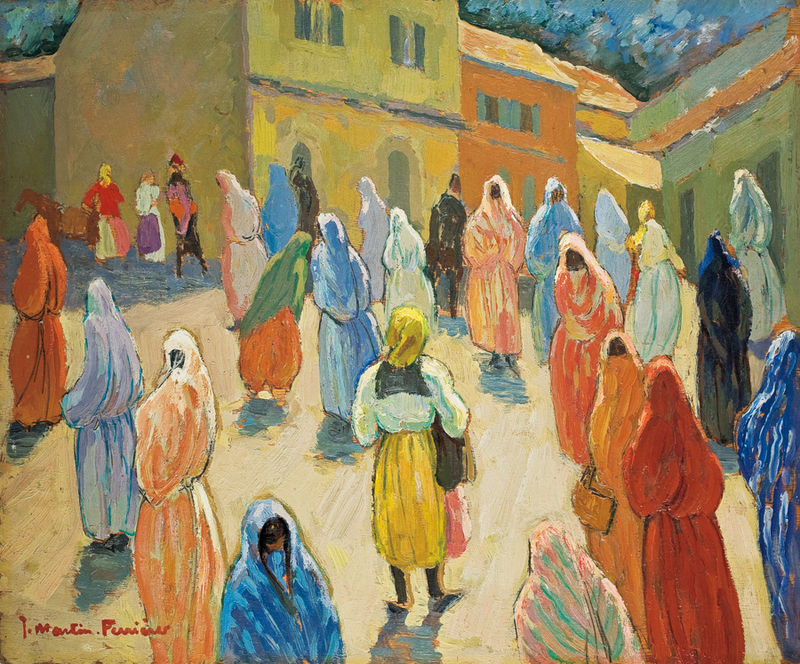 In 1928 his remarkable “Marche d’Assissi” was awarded both the Gold Medal of the Paris Salon and the Prix Legay-Lebrun and was then purchased by the City of Paris. From that point on, the critics were unanimous in acknowledging his talent. In 1930 the French State purchased one of his paintings for the Musee d’Art Moderne. From 1928 to 1933, Martin-Ferrieres devoted himself entirely to the execution of the powerful, sumptuous frescoes of the life of St. Christopher in the church of Saint Christopher de Javel in Paris. Other large scale decorations followed on both religious and secular themes. It was in 1933 that Jacques Martin-Ferrieres went to Spain for six months and there vitalized and lightened his palette, which up to that time had been consciously toned done. A visit to Greece followed, where he was dazzled by the magnificent pink light, and then one to Yugoslavia, which drew out his innate delight in the spectacle offered by crowds. In 1937 he won the Gold Medal at the Exposition Universelle, and in 1939 he had a large retrospective exhibition in Paris consisting of more that one hundred and fifty canvases and studies resulting from his journeys and showing the range and diversity of his talent. The war years interrupted his painting. Martin-Ferrieres took part in the work of the Resistance in Dordogne. He was captured by the Germans and sentenced to be shot. His life was spared, but it was nearly 1950 before he again began painting and traveling. He went back to Italy and especially to his beloved Venice, which had already inspired many of his finest canvases; to Portugal, Switzerland, Belgium. Holland, Germany, Scandinavia and to Russia, drawing and painting everywhere he went. Travel was an integral part of the inspiration of Martin-Ferrieres, and he never ceased to find new subjects for his brush in the various countries which he visited. In addition to the honors and awards received in the Salons, Martin-Ferrieres was honored by his country. He was made an Officer of the Legion of Honor in 1956, having previously been named a Chevalier of the Legion in 1937. 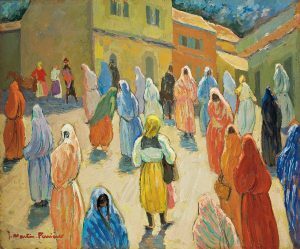 Jacques Martin-Ferrieres was an artist whose interest in human beings and life around him became keener with the years. He was a man brimming with life who extracted the artistic essence from everything he experienced. He was a well-rounded artist, who produced striking portraits, landscapes, still lifes and monumental mural frescos and decorations. His work is characterized by technical skill, solidity of drawing and superb sensitivity to color. 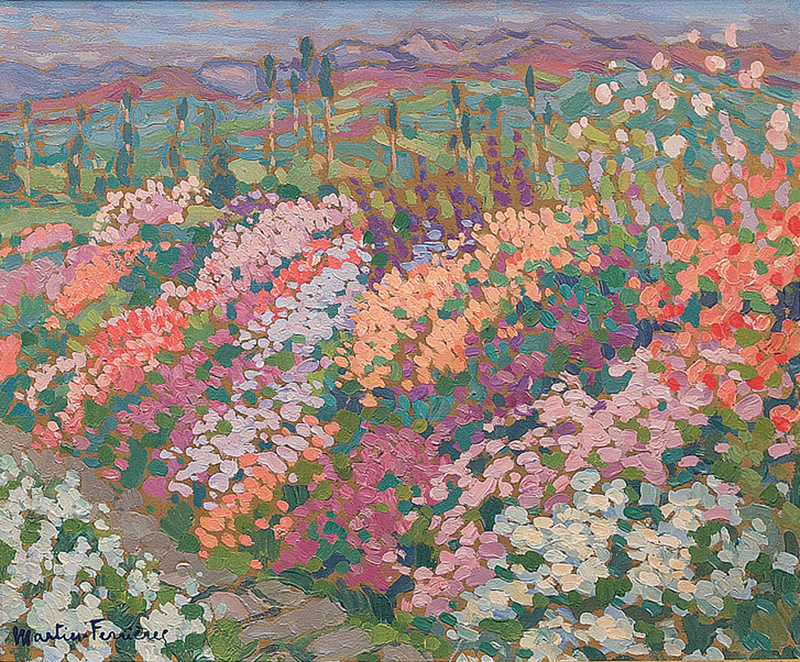 His palette was originally quiet but shifted to fresher and warmer colors used with restraint and with an appreciation of shades and their complexity. 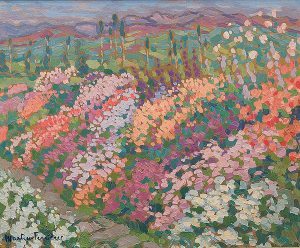 Whether he painted figures, florals or landscape paintings, all express the same joy of life in the veritable feast of light and color.